Its first Vivo IPL 2019 Season match between Defending Champions CSK Vs RCB. Winning the Toss, Ms Dhoni Opted to bowl first. The pitching Turning very fast. The RCB line up was very strong on the paper, but this time also they disopionted the crowd and rcb fans. They have king kohli, AB Develliers, Hetmayer, Moin Ali. Looking like they have strong batting Line up, but they fall very quickly in the Match. Some brillient and Fiel sttings and catughts are put CSK in Commanding Position. They recstricetd RCB for 70 Runs for All out. Only Parthiv Patel was scored double figures, he scored 29 runs. The Chennai Super king Spinners Destroy the RCB batting line up. Harbajan and Imran Thahir Took 3 Each and Jedeja took 2 Wickets. It was really Poor Performence by Royal Challangers. Chasing the Low total, Shane watson Went Quickly for Chahal. He Went for Duck. then Ambati Raidu and Suresh Raina build some Partnership. Raina Completed his 5000 IPL runs. It was Full Packed Crowd at Chidambaram Stadium Channai. 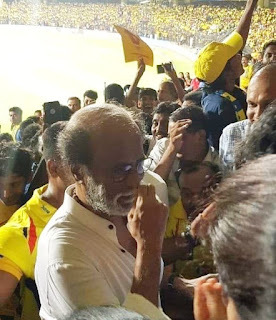 The Super Star of Tamil Nadu the Thalaia Rajinikanth also watched the Match.